Ken Bondy and Gary Powell are old friends and, in another life, used to be brothers-in-law. Both are retired, Gary from a long career in international trade, Ken as a structural engineer. Gary lives with his wife Sharon and their labradoodle Paddy in Charlottesville, Virginia, and Ken lives with his wife Pam in Bell Canyon, California. 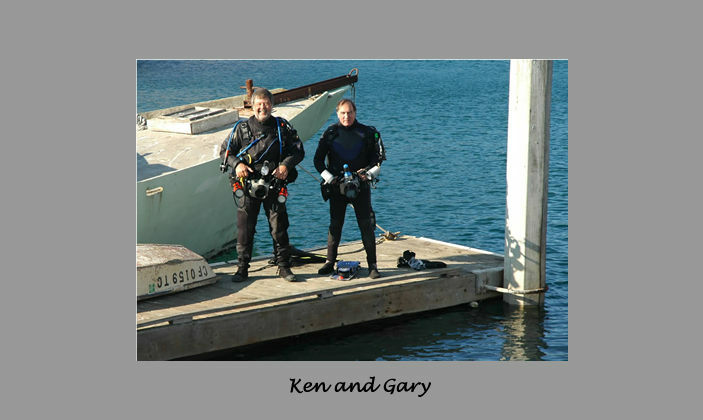 They have been diving and taking underwater pictures in Morro Bay for more than thirty years. They have dived all over the world; both consider the old North T-Pier in Morro Bay to be one of the best "muck dives" anywhere. Under its creaky wood deck, on a silty sand bottom, an amazing number of animals, vertebrates and invertebrates, live out their lives in and on an eclectic collection of man-made junk, stalking their prey from beer bottles, PVC pipes, toilets, tires, old engine blocks, boomboxes, whatever we humans have discarded over the years. The animals living in this junk are some of the most beautiful and bizarre creatures in the world, and the ecosystem under this pier is a living treasure. Both photographers use housed digital SLR cameras, although a few of the older images in the Galleries were made with film cameras (Velvia slides). Gary uses a Nikon D200 camera in an Aquatica housing with Ikelite DS-51 strobes, Ken uses a Fuji S2 Pro camera in a Subal housing with Sea & Sea YS-110 strobes. Both use Nikon 60mm and 105mm lenses.